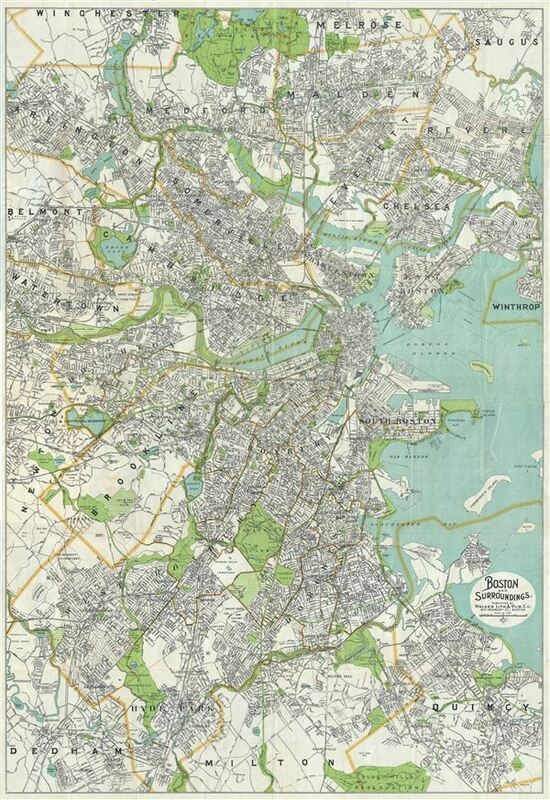 This is a beautiful c.1910 map or plan of the city of Boston, Massachusetts and its surroundings by the Walker Lith. and Publishing Company. It covers the city and suburbs from Blue Hills Reservations and Milton north to the Middlesex Fells Reservation and Winchester and from Belmont in the west to Winthrop in the east. The map is extremely detailed and notes individual streets, neighborhoods, parks, ponds, bridges, individual buildings, lakes, cemeteries, roads, railways, islands, rivers and a host of additional topographical features. This map was published by the Walker Lith. and Publishing Company at 400 Newbury Street, Boston. Very good. Minor wear along original fold lines. Professionally flattened and backed with archival tissue. Comes with original paper binder.